Calls for Attorney General Loretta Lynch to step down, have heightened, following disclosure of a private meeting between her and Bill Clinton. Compromise? Conflict of interest? Or how can the meeting between former President Bill Clinton and the United States' Attorney General Lynch at the Phoenix Airport and inside an aircraft be viewed? Ordinarily, the meeting between Clinton and Lynch would not have raised brows, if the wife of the former is not under investigation for a reason that the world already knows. It is why the impromptu meeting between the former president, whose wife is running for president and the attorney general, whose office is handling the investigation into the Mrs. Hillary Rodham Clinton's the use of personal email server at an airport and inside an aircraft has more than meet the eyes. 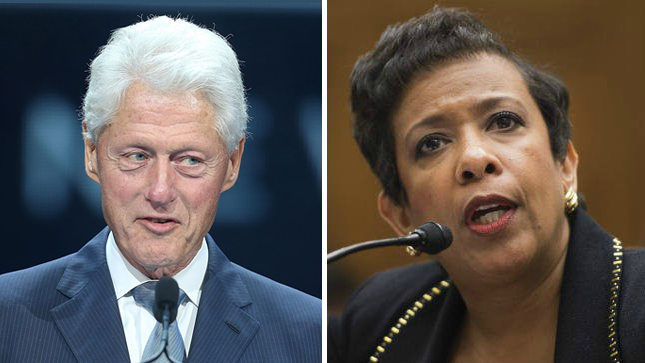 Information reveals that Lynch had said there was no discussion about the investigation of Mrs. Clinton between her and the former president. And nor was there any discussion about the Benghazi investigation report that was released early this week. Lynch is reported to have said that the only point of discussion between herself and the former president was about the grandchildren. She said the former president met and greeted her husband and children an that they discussed about their grandchildren. But the Conservative news outlets are not letting go that that there must be something questionable for the former president and the attorney general to meet at an airport and in an aircraft for 30 minutes. Already, some political pundits are talking the attorney general and compromise of the integrity of office and conflict of interest. They are saying that this is not the time that there supposed to be any meeting that no one knows the cause or discussion between a man whose wife is under investigation and attorney general whose office is in charge of the investigation. However, curious observers have tried to read more meaning to the meeting between the former president and the attorney general. It is about the likely uncertainty and the swinging pendulum in the investigation against the Democratic Party presumptive nominee for the next presidential election. Others are saying that it is one of the problems associated with investigations of the type against Mrs. Clinton. They say it is more than an ordinary problem, when you under investigation and you are running for political office, in which the office of the attorney general is supposed to be seen as above board. But the question remains, whether by meeting privately with Clinton, if Lynch has tainted her position as attorney general. And if Mrs. Clinton is not running for office and under investigation, would anyone care about a meeting between him and the attorney general?